Congress MLAs looking for 'honest' and 'energetic' officers in their area! Chief Minister Kamal Nath's 'transfer strategy' in the wake of Lok Sabha elections! FEB 13 (WTN) - In the state of Madhya Pradesh, Congress has come back after 15 years, so it is clear that the Congress government will want to appoint its preferred officials to the responsible posts to implement their policies effectively. In the same sequence the Kamal Nath government is constantly engaged in administrative surgery. For your information, let you know that Chief Minister Kamal Nath has transferred more than 750 officers so far, in which many collectors and SPs have been transferred. But keeping in mind the Lok Sabha elections now, Chief Minister Kamal Nath has also made the intention of giving preference to legislators in the transfers; that is, Chief Minister Kamal Nath has now started working on his ‘transfer strategy’ to win the Lok Sabha elections. According to the sources, this is because the legislators believe that keeping in mind the Lok Sabha elections, the Congress government will have to implement on the people related works as soon as possible and this work can be done easily and perfectly by 'honest' and 'energetic' officers only. In such a way, the MLAs think that the 'competent' officer should be appointed in their assembly constituency so that they can transfer the benefits of the state government schemes to the general public as soon as possible. 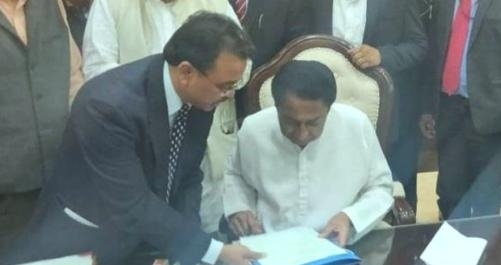 In this way, many Congress MLAs have given more than 100 applications for the transfer of officers to Chief Minister Kamal Nath. After seeing the maximum number of applications, Chief Minister Kamal Nath has now ordered that the transfer of officers will be approved on the demand of the legislators also. At the same time, the minister in charge of the district will be able to approve the transfer proposal of the legislators. For your information, let you know that after the formation of the Congress government in the Madhya Pradesh, the Congress MLAs have applied the applications in CM Monit to transfer their 'likes' and 'dislike' officers. Though so far, no transfer has been done according to the 'likes and dislikes' of the legislators, but now Chief Minister Kamal Nath has decided to fulfill the demand of Congress legislators. According to the information, the government will take action on more than 100 applications imposed by legislators in CM Monit. At the same time Chief Minister Kamal Nath has given instructions to Chief Secretary SR Mohanty to approve the transfer applications of A Plus category. On the same, according to the transfer policy of year 2017-18, oral instructions of transfers between districts and tehsils has been given to the ministers in charge. That is, now with the approval of the in-charge of the minister, officials will be transferred between districts and tehsils. It can be said that through the ‘transfer strategy’ of Chief Minister Kamal Nath, the Congress can get a lot of benefit in the Lok Sabha elections. It is being said that Congress MLAs can transfer the benefits of the Congress Government's schemes to the public as early as possible through the officials of their 'choice' and MLAs can 'propagate' it during the Lok Sabha elections. If Chief Minister Kamal Nath and Congress MLAs succeed in doing so, it can be said that Chief Minister Kamal Nath's 'transfer strategy' will prove to be successful.